A journey through the life, death, rebirth and transformation of special-agent KABUKI, portrayed with amazing artwork with an vary of utensils (pencils, cole, paint, collage, lace, feathers….) 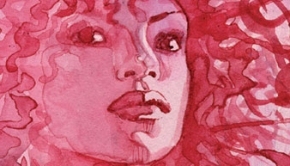 to create something I can only call ART… the soul-searching adventures of Kabuki by David Mack is one of the most amazing pieces in the world! !